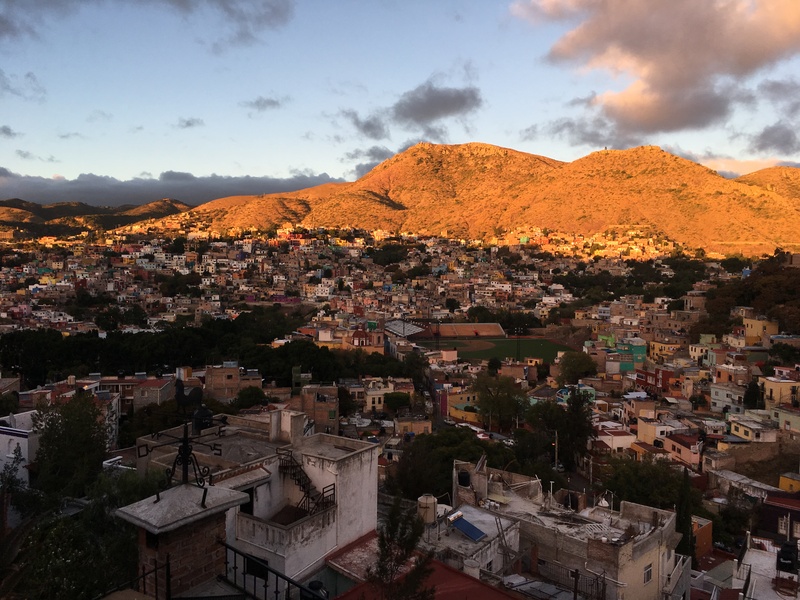 Crashing the Party in Guanajuato – Where is Lydia? Grecia asked me if I was trying to find myself on this trip. I told her, I guess so in a way. She said that people who usually do trips like mine are looking for something or someone. Grecia said when she left home she was looking for the something but never found it. She told me about how hard life in Mexico had been. She had been debating on whether or not to go back to the US but, the relationship with her parents was strained. Grecia gave me a lot to think about in the short time we talked. When I arrived at my hostel in Guanajuato, I was surprised to find that, there was a couple from Seattle in my dormitory, Ben and Twyla! They invited me to join them for dinner with another guy, Luke who was also staying at our hostel. Luke is from the Mid-West but has been living in Amsterdam for the last 10 years. Sightseeing with Twyla, Ben, Paola and Luke. Guanajuato is a magical and enchanting city. I felt like I was in Italy – I’ve never been to Italy but this is exactly how I imagine it would be. The city is full of beautiful Baroque and Colonial style architecture. Guanajuato is set in a narrow valley which, causes the streets to be winding and narrow. Sometimes the streets are so narrow that cars can’t fit through. Some of the cities thoroughfares are even located underground. Since Guanajuato is a very hilly city, the homes are staggered on hillsides. In order to reach the homes there are steep staircases in narrow alleyways. Going underground to one of the city’s thoroughfares. The four of us wandered through the winding narrow streets discovering the city until we were completely lost. None of it made sense and we couldn’t figure out how the city was laid out. We began looking for somewhere to eat, with so many options it was hard to decide. We looked at several different restaurants until we could agree on one that looked “authentic”. The restaurant was empty, practically out of everything and not very good – after one taco each we decided to do a walking tour of food. Drinking horchata and cucumber chia water from plastic bags. Street food is easy to find in Mexico and different in every state. For example, the sopes I ate for breakfast in Mexico City that were made on long and oval shaped tortillas consisting of just beans, meat and cheese. The sopes I had in Morelia were made on thicker round tortillas with lettuce, tomato and a cream sauce in addition to the beans, meat and cheese. In Guanajuato the tortillas were smaller than I had seen in other states and made of yellow corn instead of white. We ended up finding street tacos and tamales for dinner and ate until we were uncomfortably full. Eating delicious Mexican street food. After dinner, we noticed a group of what appeared to be students (Guanajuato is a college town) dressed in mid-evil costumes playing instruments. We had no idea what was going on but it looked fun so, we decided to join the party. After a few songs they began to move to a new location, singing all the while. We followed the crowd and when they reached a new location continued to preform. As we looked around, we noticed that everyone was holding a strange white ceramic container that looked like a neti pot. We found out it was filled with sangria! We also noticed that everyone in the audience looked around the same age and were wearing name tags. We put two and two together and realized we were sitting amongst the parents of these students. Students in their festive costumes preforming for their parents. The band began to move again so, along with everyone else we followed. The students lead us to a building and all the parents began to enter – of course we followed. When we got inside we realized it was some sort of banquet dinner for the families. One of the parents kept encouraging us to join. We were debating on whether or not to go in when a woman who, clearly worked for the school came up to us and told us we needed to leave. Full, exhausted and slightly embarrassed we headed back to the hostel to get a good nights sleep. My new change of course was proving to be a good choice. In the end I was able to find something I was looking for – good friends and a good time! Things were really starting to look up. The next stop would be Oaxaca!